See how much you could save with Embark Insurance Group. Accidents, disasters, and other unexpected occurrences can wreak havoc in the lives of ordinary Georgians, who thought things were going well and suddenly realize they have lost most of their savings. Is there anything people can do to prevent having to start completely over when things go a bit bad? 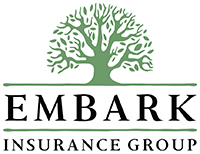 The solution is to have adequate insurance coverage, such as that provided by the agents at Embark Insurance Group, Inc.
Insurance provides the security of knowing that there will be financial resources available to handle the problems that happen to everyone from time-to-time. With solid policies in hand, homeowners, entrepreneurs, parents and children, all find it easier to go to bed each night. The anxiety of having to worry about what could go wrong does not exist for those with full insurance coverage. Instead, Embark Insurance Group, Inc., clients can go about enjoying life to its fullest. Georgia requires resident drivers maintain liability insurance to cover bodily injuries and property damage. These policies must pay for bodily injuries done to others and damage to their vehicles. It is also wise to consider physical damage insurance to cover problems with the vehicle of the policy owner. Owning a home is the way many Americans accumulate wealth. Protecting this investment is a necessity. Home insurance policies can provide needed funds to repair property damage. Just ask an agent for types of available coverage. It is easy to get started protecting home, business and family with the user-friendly Embark Insurance quote feature. Otherwise, just contact an agent today for a no-hassle experience. Embark Insurance Group | Website Development by EZLynx® · Copyright © . All Rights Reserved.